Sometimes, life brings you pleasant surprises. 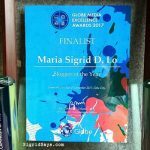 For Shane and I, it was an unexpected, all-expense paid trip to Cebu and a memorable stay in a Radisson Blu Cebu business class room. 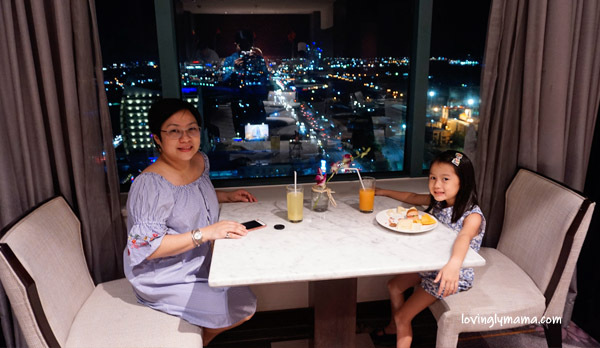 Shane and I are grateful for the luxurious mother and daughter bonding that we had at the Radisson Blu Cebu, courtesy of our friends from Nestogrow and Nestle Philippines. 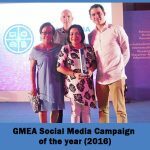 Earlier this year, our little Shane was selected as one of the Nestle influencers (NINfluencers) for NESTOGROW. She was chosen for the #GrowHappy campaign because Nestokid was reformulated and repackaged into a livelier and happier brand and became Nestogrow. At the lobby, facing the entrance, taken upon our arrival. We had to wait several hours for our room because we arrived on the first flight. 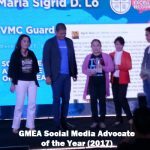 Part of the deal was to attend the Nestogrow Grow Happy Nation Cebu event at SM City Cebu and we were billeted at the Radisson Blu Cebu. 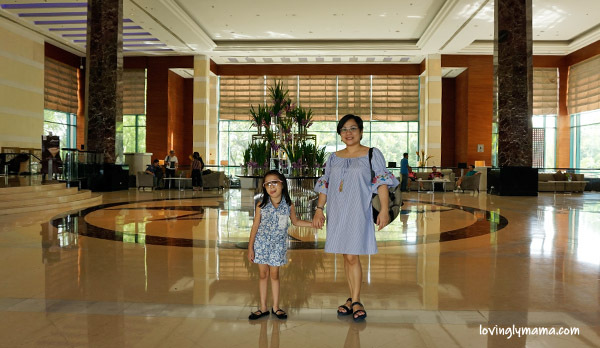 We have stayed in this Cebu hotel several times over the years whenever we go to Cebu, but this was the first time that we stayed in a business room. The grand lobby of Radisson Blu Cebu. This was also our first trip for just the two of us. 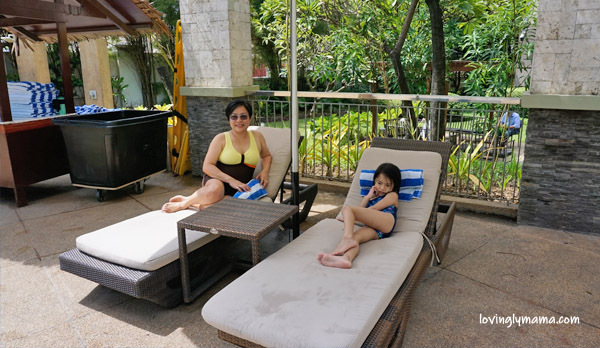 It was a luxurious getaway and a great mother and daughter bonding opportunity. 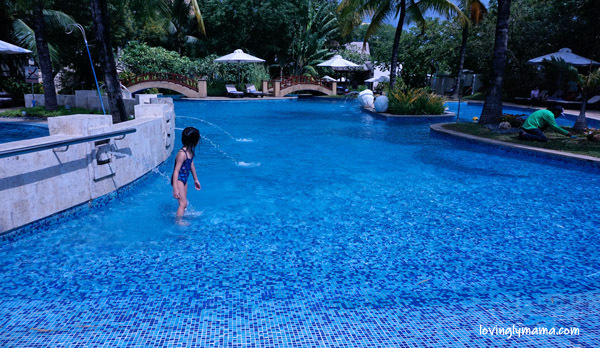 The Radisson Blu Cebu provides 5-star accommodations. 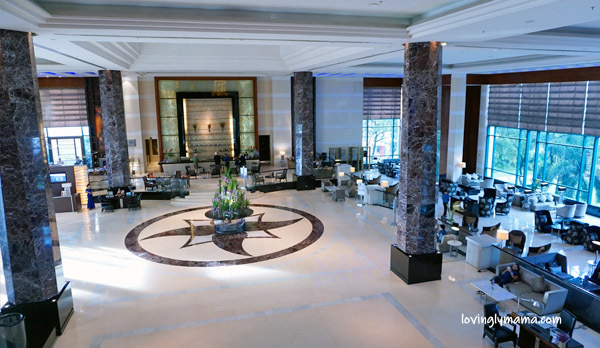 It has a grand lobby, a lovely pool, garden, bar, ballroom, function rooms, and many more. 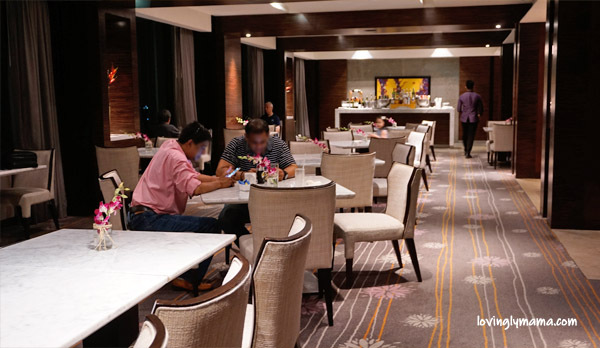 There are more than 400 rooms in this centrally located Cebu hotel. We waited by the poolside while our room was being prepared. One thing about the Radisson Blu Cebu Business Class Room is its size. It’s a spacious 35-square meter room, which gave us a lot of area to move and even play around. The kids usually bring their toys when travelling to keep them occupied, so Shane just kept on running around the room. It would have been comfortable still, even if we had our Papa and Achi Shawna with us for this trip. The room is huge! 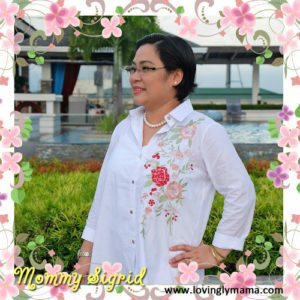 The first time we went in, 5-year-old Shane exclaimed, “Oh my gosh! If this is a dream, please don’t wake me up!” Imagine that. The room was just so exciting for her. 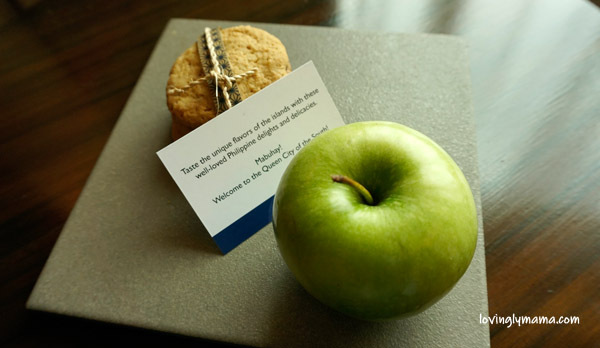 Our welcome gift — an apple and some yummy cookies. 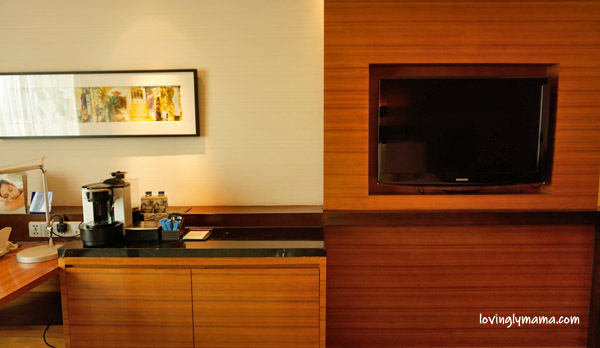 The Radisson Blu Cebu business class room is especially designed to answer the needs of the corporate traveler. There’s a total of 41 of these business class rooms. And we had the privilege to try out one. Our king sized bed. Notice the fully carpeted floor. When we opened the door, a gentle and pleasing scent greeted us. The room featured muted tones and was well-appointed. We surely enjoyed lounging and sleeping on the king-sized memory foam mattress. 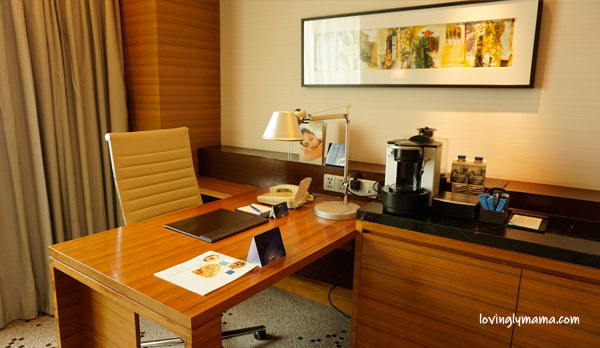 The executive desk, coffee and tea-making facilities, as well as an espresso machine. You will also see the complimentary bottles of purified water at the back. Plus, I was also able to enjoy the executive desk and comfortable chair while working. Despite the fully carpeted floor, I didn’t smell a hint of dust or dankness around here. And I have a sensitive nose. The other side of the bed. Look at the spaces where we can maneuver. 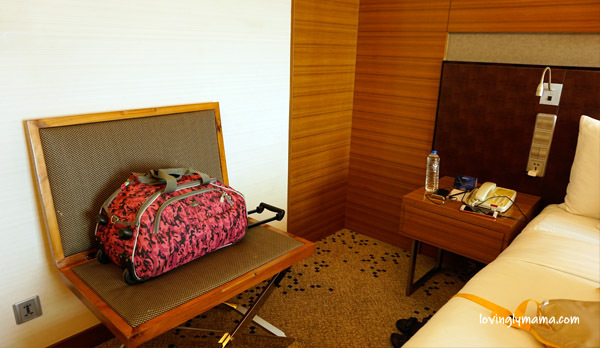 Other business amenities include the pressing of two garments, express check-in and check-out, and access to the Business Class lounge, which was on the 15th floor. We have the option to have breakfast, all-day refreshments and evening cocktails there. Meanwhile, the other room amenities included a 37-inch LCD satellite television, an in-room safe, a walk-in shower, a minibar, bathrobes and slippers, an iPod® dock entertainment system, and a coffee- and tea-maker. We even had a portable espresso machine in the room! 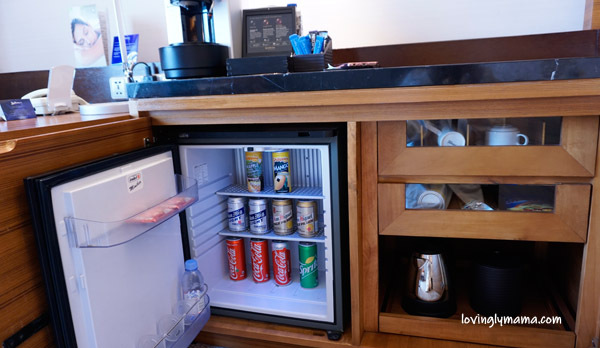 The mini bar, coffee- and tea-making facilities. I totally forgot now the name of the front desk officer, was it Solitair? Or Sunday? But I just wanna mention that she graciously explained the perks that came with our room. She also even personally assisted Shane and I in taking the elevator. Lovely lady. We arrived on the first flight to Cebu from Bacolod, so it was still pretty early for check in. The front desk officer tried her best to get us accommodated early and also arranged for a late check out the following day. Of course, these are dependent on the availability of the room, but I was just happy to be accorded such liberties in a 5-star hotel. The scene in front of us while lying on the bed. 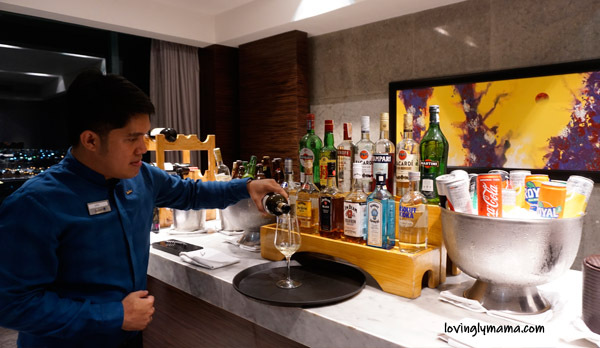 One of the perks of the Radisson Blu Cebu business class accommodations is access to the business class lounge on the 20th floor. Snacks and refreshments are available there all day. The Radisson Blu Cebu business class lounge on the 20th floor. In the evenings, there are also cocktails. Guests may opt to have their continental breakfast here if they don’t want to have the breakfast buffet in the restaurant. Although the food choices are limited, at least you get exclusivity. We settled on this table at the business lounge where we had a view of the city. Shane and I had cocktails at the lounge around 6pm. She got so excited because there were so many food choices and there were only a few of us there. 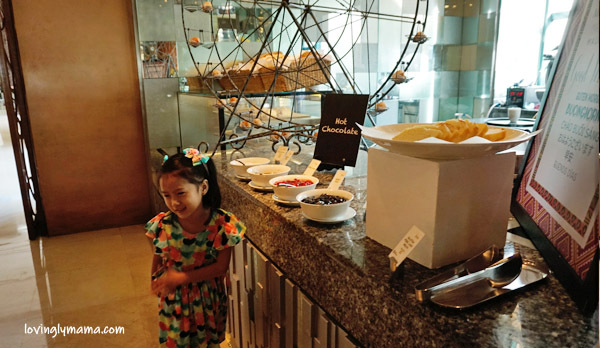 A free spirit, she was happy to roam around and pick the food that she liked, including gummies at the candy bar. We were both quite full so we didn’t need to eat dinner anymore.We just retired early and enjoyed the comforts of our room. 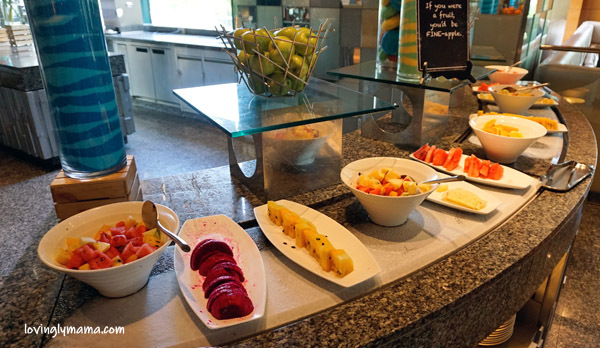 The Radisson Blu Cebu business class lounge serves a variety of finger foods from different cuisines. We had a jolly time sampling a lot of them. And food is really good! 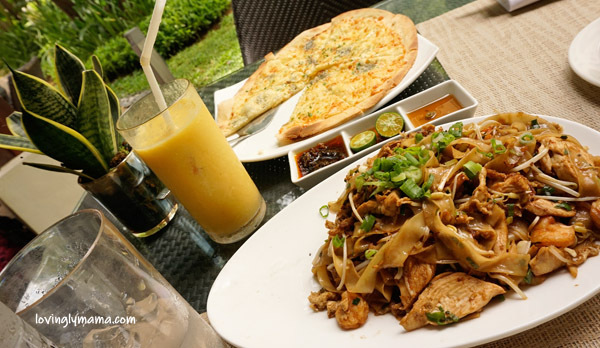 Radisson Blu Cebu is known for their fine cooking. For lunch on our first day, we just ordered food at the poolside because our room wasn’t ready yetBut it was fine because they allowed us to use the pool while we were still waiting. Meanwhile, our bags were safely deposited at the concierge. This was truly a grand vacation for Shane and I. That kid owns the pool again. We ordered cheese pizza for Shane and pad thai for me. All that we ordered were delicious and the servings were also big. Each order was good for sharing. They were quite a lot so naturally, we were not able to finish them. Our lunch at Radisson Blu Cebu. We had to move to the bar in the middle of our lunch because it started to drizzle. The staff were very helpful. They knew that I was alone and with a young child, so it seemed that everyone we met went out of their way to make us feel comfortable. 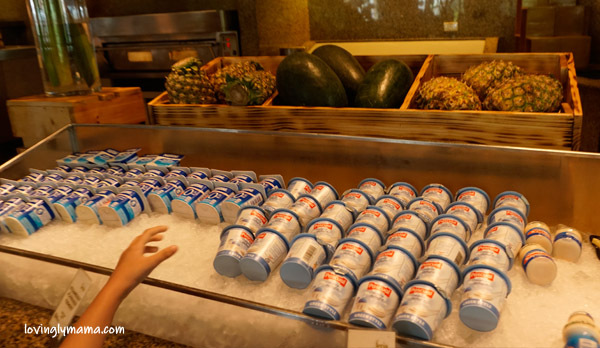 Radisson Blu Cebu is known for their sumptuous breakfast buffet. My husband and I stayed here one time as well and we declared that their breakfast was one of the most memorable that we have ever had. My special mention would be their pudding. Don’t miss that. 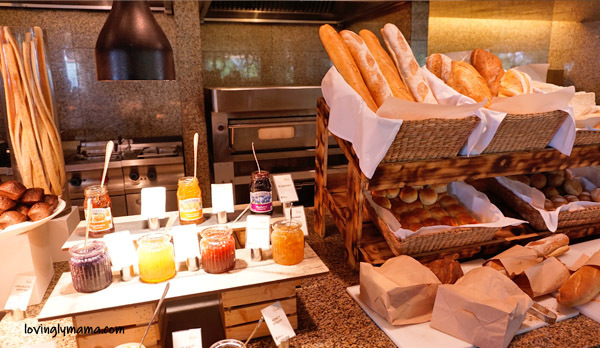 Breads and spreads a the breakfast buffet. Shane at the sweets station, waiting for her hot chocolate. I love that they have dragon fruit among their many fruit selections. Shane can be mischievous sometimes. She left some stuff inside the safe and insisted that we get them out. With tears in her eyes, she begged me to have it opened but it’s here stuff in there. But I didn’t know the combination she punched in. Plus she did something to the TV that we no longer had cable. I had to call two people to assist us to open the safe and then restore the cable TV. But when the safe was opened, we found out that she only left three sheets of stationery in there. I was embarrassed and had to apologize to the staff. hahaha Silly girl. I thought it was a toy or something, but well, I guess that was important for her. There was just the two of us by the swimming pool that morning. So we frolicked and sun bathe. And posed for lots of pictures. Shane also thoroughly enjoyed the water spouts around the pool. She jumped around them a lot. Shane kept laughing and giggling by this water spout. It is always a happy coincidence that almost always when we go swimming at a hotel, we have the pool to ourselves. Radisson Blu Cebu is right beside SM City Cebu. As in, literally, it’s just across a narrow road. So after my afternoon nap, Shane and I went malling. We chanced upon the Korean Film Festival going on there and they had this area where you can wear Korean costumes and have your photos taken by their set ups. Tea time for Princess Shane and mom. 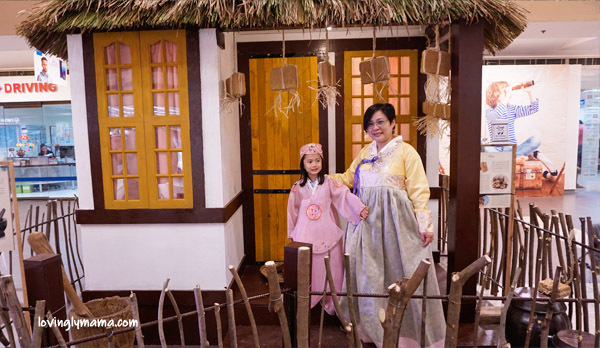 The little girl was really in character as a Korean princess. A rural scene in Korea? Naaa, it’s just at the SM City Cebu. 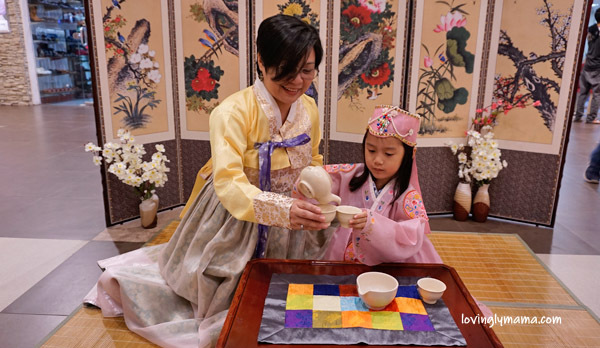 So I guess a trip to Korea would be in order for our family travel bucket list. By the way, she only asked for a small box of Nerds and that’s the only thing we bought for her. Philippine Airlines and Cebu Pacific flies twice daily from Bacolod to Cebu. Meanwhile, Bacolodnons may also want to take the Ceres bus to Cebu. For this trip, Nestle booked us a round trip flight with PAL. Mother+daughter time is precious! I absolutely love it. 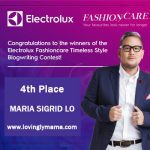 Plus, you were able to spend it luxuriously at the Radisson Blu Cebu. Travelling with your child is always fun. Times like these are my precious memories with my dear mother. This bonding moment with little Shane looks so lovely! 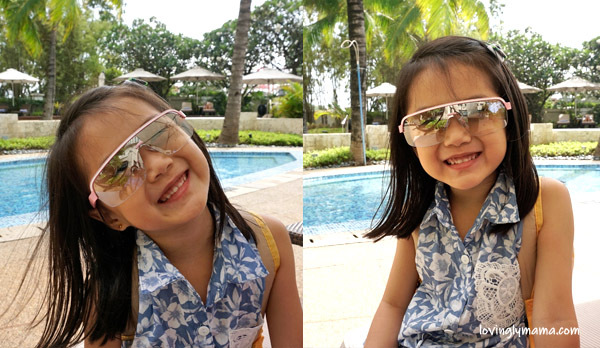 It looks like you had a great experience at Radisson Blu Cebu! 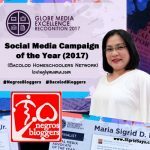 What a great opportunity for a hotel stay and from your review, this Cebu hotel sounds amazing! Wow! It looks like you guys had an amazing time. Radisson Blu Cebu hotel is beautiful. Congratulations to Shane, also! Oh wow this mother and daughter trip looks incredible! 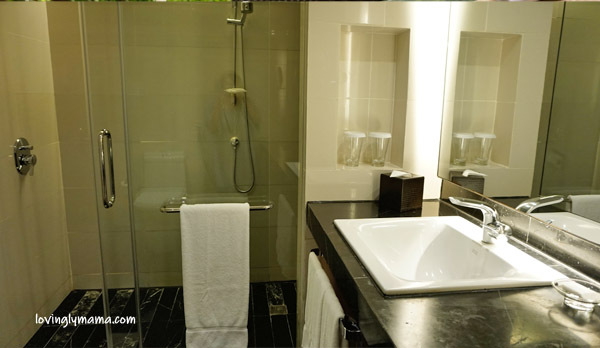 I love the Radisson hotels, they are always so luxurious and so many great facilities ! It’s great that a 5 year old girl can already appreciate a cozy, luxurious room. Now you know what exactly she wants for her birthdays. 😁 Radisson Blu Cebu looks awesome! I love Radisson Blu hotels. They are always so good looking. The pictures here look great. Wow such a beautiful bonding moment for you and your daughter. I am sure it will be a memory that the both of you will treasure for a long long time. 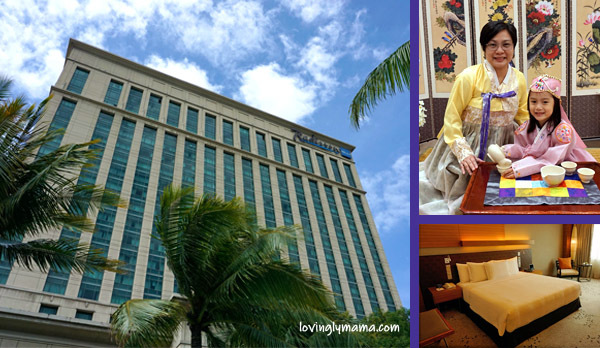 Radisson Blu Cebu hotel is beautiful and looks like it has such wonderful amenities. You and your daughter look like you all had a great bonding time. My daughter is 1 so she isn’t at the age to enjoy a mother-daughter trip like this. I am looking forward to when she is old enough. What a lovely post. It seems that you really had a wonderful mom and daughter bonding time. 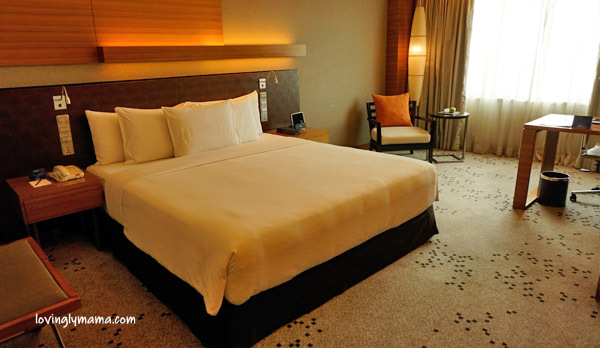 Radisson Blu Cebu Hotel sounds really inviting and elegant looking as well. 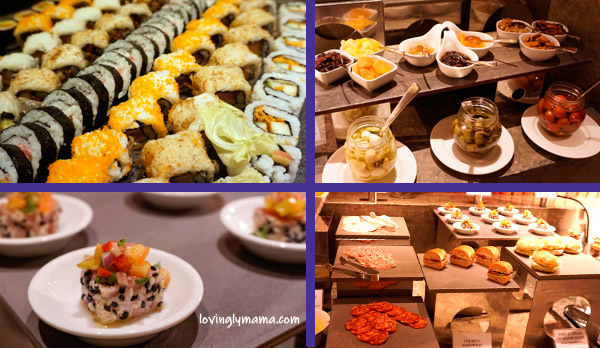 Everything about the Radisson Blu Cebu hotel is lovely, especially the food. Your hotel review is so personal. But what is most important is the time you had with your daughter! That is so precious! Aww this sounds so lovely to be able to have a posh mother and daughter bonding like that. What a lucky daughter you have! Being an influencer surely has its perks. Oh this looks like you and your daughter had a blast! 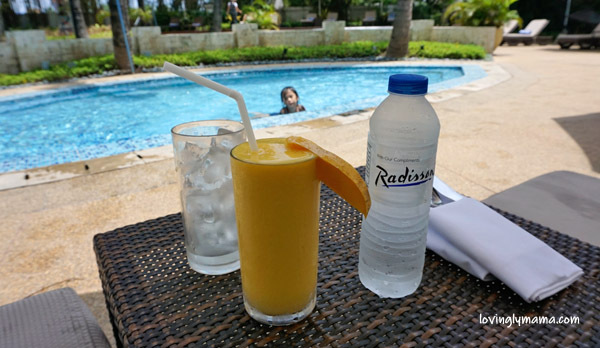 That holiday at Radisson Blu Cebu is one for the books. I’ll definitely add this Cebu hotel to my list of places to stay in! 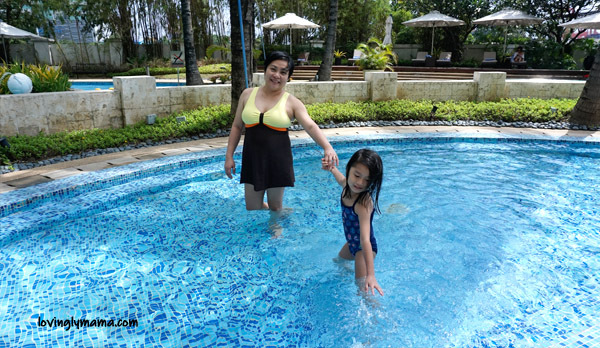 Awwww this mother and Daughter thing at Radisson Blu Cebu is so amazing! I wish we were able to have one, by the way the pool is awesome! There’s nothing better than a good bonding session with your kids right, your daughter looked like she had awesome fun!